The Affordable Care Act (ACA) sets out to provide access to health care for all. The ACA will only be fully implemented in California when all people, including low-income residents in underserved communities, have local access to quality, affordable care. Community health centers and clinics (CHCs) play a vital role in this effort by providing preventive and primary care to patients in California – and across the nation – regardless of their ability to pay. Since 2009, health centers have increased the number of patients served from 17 million to 23 million annually. With the ACA’s implementation, however, it is estimated that CHCs will need to serve 35 million patients in the coming years. The ACA gave a boost to CHCs by creating a five-year, $11 billion trust fund to support the operation, expansion, and construction of health centers. Yet only $1.5 billion is earmarked to support major construction and renovation projects at community health centers nationwide. When you dig a bit deeper, the issue becomes even more concerning. A 2013 study revealed that, in California, for the state to adequately serve its residents, CHCs need $2.26 billion in capital investments. However, there is total gap of $1.56 billion to reach that mark. It is clear that even with government funds and philanthropic investments, CHCs are going to fall far short of their financial needs. As a result, health centers will operate well beyond capacity and will treat patients in less than ideal facilities. From kids with excessive absences falling behind in school to illness-related loss of work hours for adults, the lack of health care access will have severe repercussions across the state. Where can the financial planners at community health centers and clinics turn for financing? Mission-driven lenders from the Community Development Financial Institution (CDFI) sector can play an important role in providing the flexible and low-cost loans that meet this need. One example of this is the $20 million Healthier California Fund. Launched by Capital Impact Partners in partnership with The California Endowment, this fund gives help and hope to those who seek financing so health care services can be provided to those most in need. The goal of the fund is to support strong, healthy communities across California by working with CHCs to provide access to quality care. Unlike traditional banks, Capital Impact shares a mission with the health centers it serves, supporting them with technical assistance and creative financing. The Healthier California Fund also supports projects that demonstrate an innovation in how care is delivered, with subsidized interest rates and financial support for technical assistance. This fund is just the newest initiative behind Capital Impact’s dedicated efforts to serve CHCs in California, as well as nationwide. 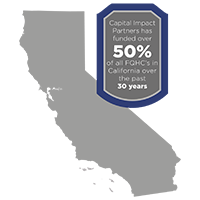 Over its 30-year history, Capital Impact has financed more than 50 percent of California’s CHCs. With over $250 million in loans, Capital Impact is the state’s largest nonprofit health care lender. These loans have helped provide much needed health services to thousands of low-income and uninsured patients. In addition to bringing health care to those who need it most, these projects provide jobs and help to boost local economies. Axis Community Health: Capital Impact provided Axis with a $6 million loan to help the center double its capacity. Through the construction of 27 new exam rooms, seven mental health counseling rooms, patient education facilities, and a pharmacy, the clinic can now handle 60,000 patient visits per year. The clinic provides medical and behavioral health services – including the area’s only teen outpatient drug and alcohol recovery program in the Tri-Valley area – the cities of Dublin, Livermore, and Pleasanton in San Francisco’s East Bay. The original Axis clinic, built in the 1970s, is at capacity and in desperate need of renovations. This loan helped to transform a building – formerly a furniture display warehouse that had been vacant for several years – into a state-of-the-art clinic that is designed to better integrate physical and behavioral health care into a seamless process for the patient. The new building, located in Pleasanton, CA, is two miles from the original site, which will be renovated and continue to house exam rooms. 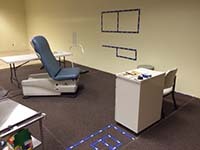 Clinica Sierra Vista: Capital Impact made a $2 million investment for the construction of facilities to provide comprehensive, community-based services including health care, behavioral health, drug and alcohol counseling, and nutrition and education programs for patients in Kern, Inyo, and Fresno counties. 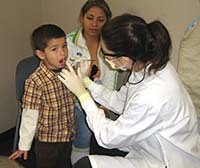 Clinica Sierra Vista serves a varied population that includes low income families, migrant workers in California’s Central Valley, and local homeless populations. South Central Family Health Center: Capital Impact financed $1.77 million in construction loans to build exam rooms, labs, and diabetic care and prenatal care facilities for this center. Some funding for the new building – which will join three other sites at Vernon and Central in Los Angeles – came through the CPCA Ventures Fund, which is designed for financing projects under $1 million. This money allowed the Center to begin construction before it received grant funding from its capital campaign, allowing for an earlier completion of the building than would have been possible without Capital Impact’s support. The new building is expected to open in the fall of 2016. The Affordable Care Act is helping many, no doubt, but the ACA doesn’t discharge our responsibility to those who lack necessary healthcare resources. By investing in our most vulnerable, the Healthier California Fund opens new doors of hope for so many in our state – to quality health care, new job and economic prospects, and, most importantly, to the opportunity for all Californians to lead happy, healthy, and productive lives.